University United Methodist Church will join in the commemoration of International Transgender Day of Remembrance (ITDOR) on November 20, 2013. 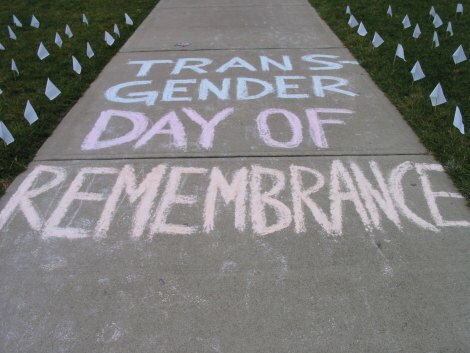 From 12-1pm, UUMC will host a service to remember those who have been killed this year due to anti-transgender violence and to raise awareness of the threat of harm faced by those who are transgender.The International Transgender Day of Remembrance began in the late 90s to commemorate the life of Rita Hester and has occurred annually ever since to raise awareness and honor the lives of others who have who have been victims of anti-transgender violence. Although not every person represented during ITDOR self-identified as transgender, each was a victim based on bias against transgender people. The service will include prayer, a sermon by Rev. John Elford, music and a ritual of remembrance including the naming of those whose lives were taken this year. All are welcome to join UUMC to remember, reflect, and move forward in hope. Free parking will be available in the Platinum Lot beside Mellow Mushroom across the street from UUMC. Please enter the Sanctuary from the south entrance at 24th st. Any questions about this event can be directed to Mary Ann Barclay, Justice Associate, at mabarclay@uumc.org. For more information about ITDOR check out the official Transgender Day of Remembrance site & GLAAD.